1) What four places did my ancestors live that are geographically the farthest from where I live today? William Edward Ball, and his mother Esther Erickson from Goteborg,Sweden (his father was originally from England). The Richardsons and Dandies from Fifeshire, Scotland. The Richardsons I’ve only traced back to 1827 in Cupar, while the Dandies lived at Ferry Port on Craig and Kilmany . 2) What are the four most unusual given names in my family tree? I found it hard to select four unusual given names as the given names of my ancestors weren’t that unusual. My grandmother’s middle name: Meriden. 3) What are the four most common given names in my family tree? For the statistics on the most common given names, I also set up a family tree in Legacy with just my ancestors, and then ran the Statistics report. One thing I did notice was that these statistics are only where the given name is a first name. If middle names are included these figures are slightly higher. I found it hard to determine which given names were unusual by simply looking through the name list in Legacy. 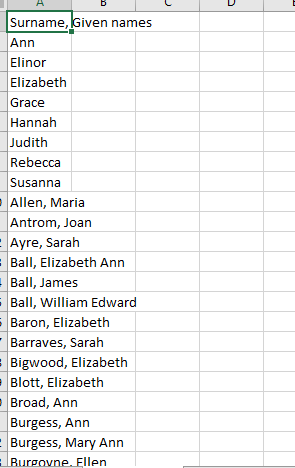 I decided it would be easier to set up a pivot table, so that all the instances for the same name would be combined. And I also wanted for middle names to also be combined, so that an ancestor with the name William John, would have the William in with all the other Williams, and the John in with all the other Johns, rather than a separate name William John. First, I went in to the Name List in Legacy, and chose Print. 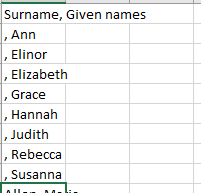 Then I selected to just include surname, given name, and then I chose to create a CSV file. The next step took a little bit of work. I had a few names without surnames, so I needed to add a comma and space to the beginning of these, in order for the next steps to work properly. I then needed to move all the middle names into their own rows. The next thing to do was to use Text to Columns to separate the surnames and given names into separate columns. This made it a lot easier to go through the list of names, and decide which of them were more unusual. 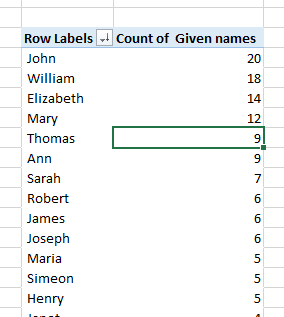 I could then sort by value from largest to smallest to also find the most common given names. Although I ended up with the same four names as from the Statistics in Legacy, the counts were slightly higher.